TEL AVIV/JOHANNESBURG, 27 February 2014 (IRIN) - Israel has released figures showing that the number of African migrants choosing to accept “voluntary departure” from the country has been steadily increasing since an amendment to its anti-infiltration law was passed in December 2013, with about 2,200 departures recorded since the beginning of 2014. However, the voluntariness of the procedure has been called into question by migrant rights organizations and the migrants themselves. According to the amended law, the alternative to accepting voluntary departure can be indefinite detention in a new “open” facility, known as Holot, in Israel’s southern Negev Desert. Besides the threat of detention, the government is offering a grant of US$3,500 to those who agree to voluntary departure. The government recently increased the amount of the grant from $1,500. 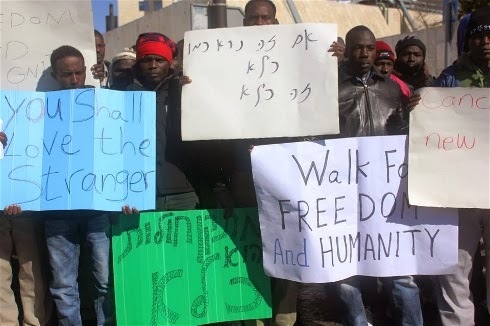 “Every week they come here, offering us money if we sign for voluntary return,” said Khalil*, a Sudanese migrant who was moved to Holot in December from Sa'aronim, a conventional prison where irregular migrants were detained until a September 2013 Supreme Court ruling ordered their release. The amended law reduced the time that irregular migrants can be detained from three years to one, but allows for the indefinite detention of asylum seekers who cannot be deported. Of the 53,000 asylum seekers currently living in Israel, according to the UN Refugee Agency (UNHCR), the majority are from Eritrea (36,000) and Sudan (14,000), both countries they cannot be deported to, according to international refugee law, due to the likelihood that they would be subjected to persecution upon their return. Israel is a signatory to the 1951 Refugee Convention but has one of the lowest refugee recognition rates in the world, having granted refugee status to only about 200 asylum seekers in the last 60 years. Until 2012, Israel did not permit Eritrean and Sudanese citizens to submit individual asylum requests but instead granted them collective temporary protection – an unstable status with very limited rights. After local NGO, the Hotline for Refugees and Migrants took the state to court over the matter, the Population, Immigration and Border Authority began examining about 1,800 asylum applications filed by the Hotline on behalf of detainees at Sa'aronim Prison. However, as of January 2014, it had only granted refugee status to two Eritreans and has not broadened the process to include asylum applications from those outside the prison. UNHCR has expressed concern to the Israeli government that the new law “further limits the rights of asylum seekers”. Since Holot opened in December, about 500 male migrants have been moved there, but many more have received summonses to report to the centre within 30 days. Although detainees are allowed to leave the centre, they are required to report for roll call three times a day, making travel to the nearest town of Beersheba - about an hour’s drive away - virtually impossible. Failure to report to authorities every few hours can mean transfer to a conventional prison. In comments posted on his Facebook page, Minister of the Economy Naftali Bennett congratulated Minister of the Interior Gideon Sa’ar for policies that appeared to be successfully convincing “illegal infiltrators” to leave the country. “We are talking about migrant workers and not refugees in mortal danger. Otherwise, they would not choose to return to their country of origin,” he wrote, citing figures indicating that 1,600 migrants left the country in February, 765 in January and 330 in December, compared to just 62 in November before the new law was passed. “Again and again, we hear the Israeli government saying we are migrant workers and not asylum seekers, but if we were migrant workers, wouldn't we take the money and leave?" commented Khalil. One option reportedly being offered to Eritrean and Sudanese asylum seekers is removal to Uganda, a country that officials are claiming has agreed to accept asylum seekers from Israel. However, the Ugandan government has denied the existence of such an agreement, and there have been several reports that migrants who agreed to leave Israel for Uganda were deported soon after their arrival. Reut Michaeli, executive director of the Hotline for Refugees and Migrants, confirmed that they had had two cases of former clients agreeing to go to Uganda, only to be deported to Eritrea and imprisoned there.